The Friends of Lake Wingra (FoLW) have been cooperating with the city of Madison for over four years to determine how selected leaf control efforts in the fall can reduce the amounts of phosphorus reaching Lake Wingra. Results from the fall of 2016 are especially exciting. By increasing the leaf pickup to once a week, the potential reduction of phos­phorus is about 70 percent. 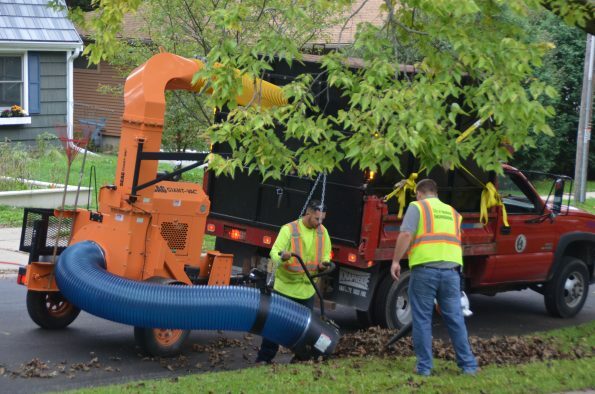 A high vacuum street cleaner and a vacuum truck collected the leaves (Figure 1). 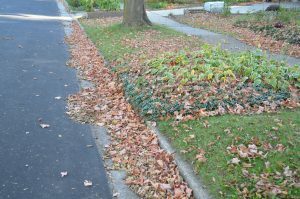 Although this frequency of pickup is probably not practical, it demonstrates the potential of improving leaf collection efforts. These results were made possible by hard working groups of volunteers and the cooperation of the City of Madison. Figure 1. Vacuum assisted equipment used to do weekly leaf pickup in the Wingra study area. Figure 2. Badger Volunteers weighing leaves for leaf control surveys. Two types of surveys were conducted by volunteers to document the benefits of improved leaf control. 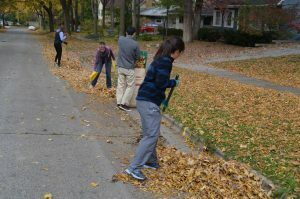 The first survey estimated the weight of leaves in the street. 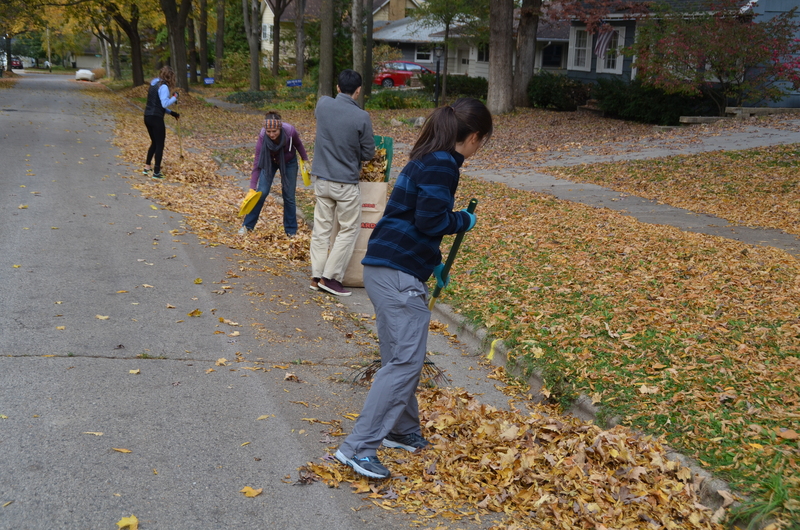 Undergraduate students (Badger Volunteers) from UW Madison collected leaves in select streets and weighed them in leaf bags (Figure 2). Pictures taken at each site provided a correlation between the weight of the leaves and each weight’s visual appearance (Figure 3). 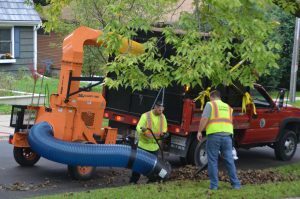 A volunteer team with FoLW conducted a survey each week at the test site to determine the weight of the leaves in the streets by referencing the pictures. To make the study useful, the FoLW surveys at the test site were complemented by surveys done by the city of Madison at a control site outside the Wingra Watershed where the leaves were not collected until the end of the fall. curbs – 5 lbs., 10lb., and 16 lbs. respectively. Last fall the homeowners in the Lake Wingra test area had a very high level of leaf control, but this fall we are documenting the opposite condition. The city will not pick up any leaves until the end of the fall. This is a lot to ask from our neighbors and we want to compliment them on their patience. Just as the comparison with the no control in the 2016 fall study, it is important to understand the leaf accumulation with no control at the Lake Wingra study site. The studies of leaf control will con­tinue until we have an appreciation of the benefits of a range of leaf control programs. 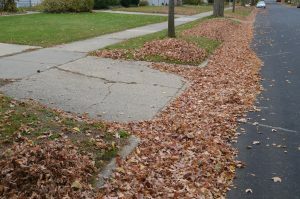 However, enough data has been collected to demonstrate how homeowners can help reduce the impact of leaves in the fall. Some of this data is being collected at four other study sites outside the Lake Wingra watershed, but still in the City of Madison. 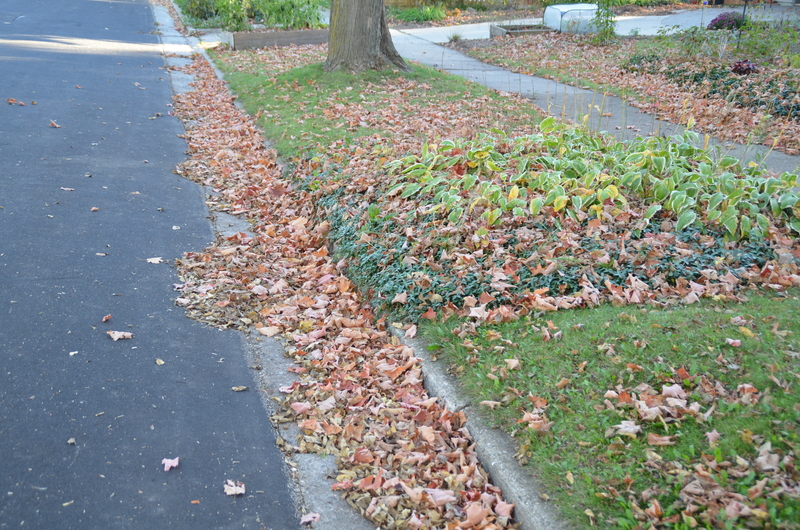 Collection of water quality samples from these other sites clearly shows the impor­tance of the leaves in the street. It appears rain water running through the leaves in the street leaches some of the phosphorus from the leaves. 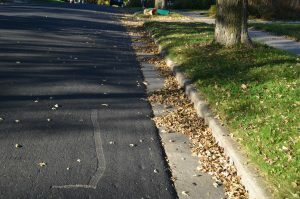 These leaves in residential streets appear to be a more important source of phosphorus than any other source of phosphorus in residential areas. 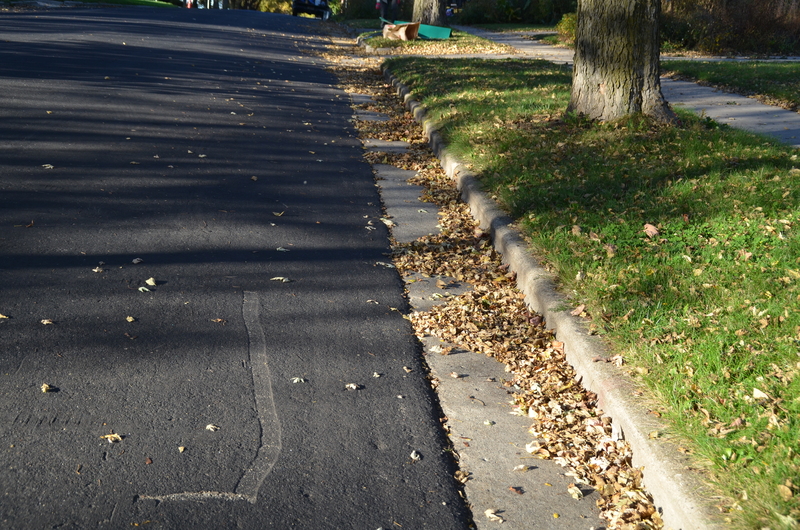 Homeowners can help reduce the amount of phosphorus reaching Lake Wingra in the fall by keeping leaves out of the street and storing them on the terrace.